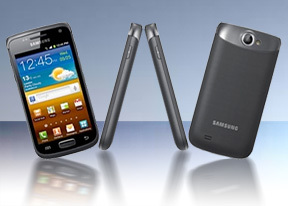 The Samsung Galaxy W comes with a 5MP camera and an LED flash. It captures photos at a maximum resolution of 2560 x 1920 pixels. Its interface looks pretty familiar with two shortcut bars on each side of the viewfinder. On the right you get the still camera / camcorder switch, virtual shutter key and the gallery shortcut (which is a thumbnail of the last photo taken). On the left, you get the front/back camera switch and the flash control. You can replace those two and add two more (for a total of four) shortcuts to any option in the Settings menu. In terms of image quality, the Galaxy W may not the best 5MP shooter in town, but it's as good as a Galaxy S or a Galaxy S Plus. In some scenes we even noticed lower noise levels while keeping the same level of resolved detail, which is commendable. The Galaxy W photos also have good contrast and accurate white balance, but the colors are somewhat too saturated. The Samsung Galaxy W I8150 enters our Photo Compare Tool to join the other 5MP shooters. The tool’s page will give you enough info on how to use it and what to look for. The Galaxy W performs very well on the synthetic resolution chart. There are traces of a pink spot that the processing software attempted to remove. The second chart highlights the effects of noise reduction on the white noise patch on the right. Finally, the third chart looks almost ridiculous - the colors are much too saturated and you can spot a yellowish tint on the black and white photo. The camera shoots 720p video at 30fps. Unlike the still camera, you can't use the video-call camera to shoot videos. The videos are shot in .MP4 with the nice sounding bitrate of 12Mbps. The videos themselves are less impressive as we noticed a lot of jaggies on diagonal lines. The sound recorded with the videos is mono (64Kbps bitrate, 44.1kHz sampling rate). Here's a sample we uploaded to YouTube for your viewing pleasure. Also, here's an untouched 720p@30fps sample straight from the phone. As you can see the Galaxy W is on par with the original Galaxy S. The third chart shows the jaggies we mentioned. The effect is noticeable on non-synthetic tests as our setup shows. When the lights go out, the amount of detail is even less.